The event will take place on 8 and 9 March 2017 at Feria Valencia from 9:30 a.m. to 8:00 p.m. Whether you are traveling from Spain or from another country, you can get Feria Valencia on an easy and comfortable way, by car, train or plane. Take line 3 from the airport terminal, direction Rafelbunyol. Change at Angel Guimerá station to line 1, direction Bétera or Paterna-Llíria. When arriving at Empalme station, change to line 4 and take the tram towards Feria Valencia. Approximate travel time between the airport and the fair is 40-45 minutes. How to get Valencia from the airport. To get to the city center from the airport you can take a taxi . The taxi rank is in front of the arrivals terminal, the approximate cost is 20 euros, or by underground. At the same terminal of the airport you can take line 3, that will take you to the center of the city. You can take a taxi or go by underground from the Xátiva station (close to the Town Hall Square and the Estación del Norte) take line 2 towards Bétera or Paterna-Llíria and when you get to Empalme station, change to line 4 and Take the tram towards Feria Valencia. Approximate travel time is 40-45 minutes. 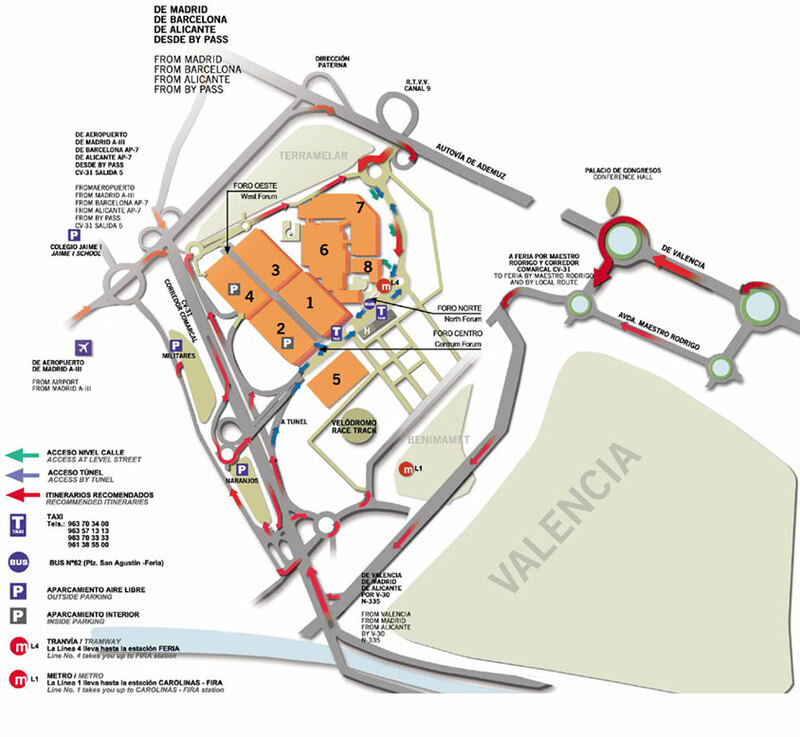 Here you will find a map of Feria Valencia with connections from the main entrances to the city.